So, when the team of Spicers of Hythe contacted me to review one of their food hampers I immediately said yes because it brings back so many memories. I decided to order a Father’s Day Hamper as I think this is an appropriate choice at this time of the year. The following day I received the Spicers of Hythe hamper. I value a fast delivery especially if you need a last minute present! I am not going to lie to you, I love food hampers. I think it's one of the best gifts somebody can receive. It is stylish, unique and unexpected too. Personally I think that there are two very important points to take into consideration for successful gift hampers. With Spicers of Hythe you can tick both these boxes because the presentation was really good and the quality of products is simply outstanding. The gift hamper that I chose is called: Dads Delight. It comes in a lovely Bamboo Tray with red trim. If you are looking for a beautifully presented gift, this product won’t let you down. We tasted all the products and they are all premium and excellent. 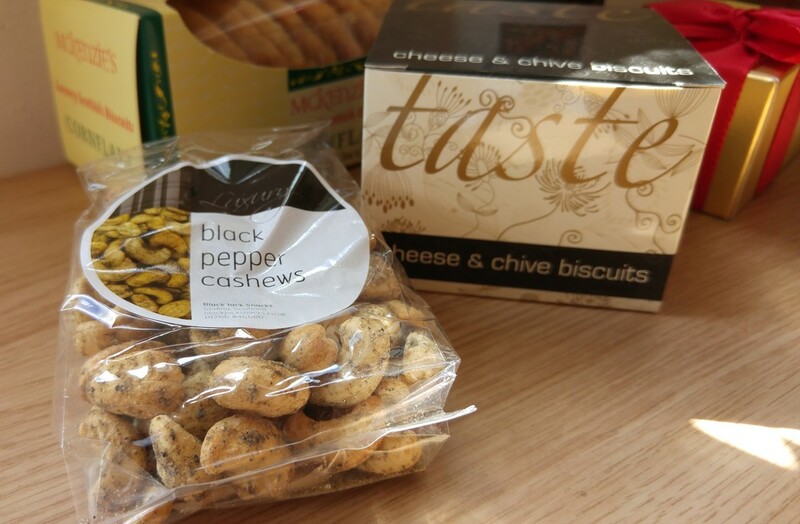 My favourites were the Taste Savoury Cheese & Chives Biscuits, the Pepper Cashews and the Red Wine. My wife loved the Scottish biscuits with cornflakes. The Wine is a Cabernet Sauvignon 2014 from Chile D.O Valle Central. This is a beautiful red wine and it was a nice addition to my meal last night. I am really pleased and impressed by the quality of products and the service of Spicers of Hythe. It is really easy to understand why they have been in the luxury hamper business since 1926. If you are looking for a unique Father’s Day gift, I invite you to visit their website: www.spicersofhythe.co.uk . Please note that the last order date (standard delivery) before Father’s Day is : Thursday 18th 2pm. But the selection of Spicers of Hythe hampers is huge: from Birthdays to Wedding. I have noticed they also have a beautiful baby gift hamper and as my wife is expecting this will be a lovely gift for sure. Best Advent Calendars 2018 for Dads and Men.